March 10, 1836: “Fair. The ladies of the Roman Catholic Church propose holding a Fair at the Exchange Tomorrow, the proceeds of which are intended for the purchase of an organ for the new church. No existing copy of the contract with the Erben company is known. However, when St. John’s Catholic church purchased another organ, the Erben was given to the First African Baptist Church where it still resides. It is no longer playable, all the interior metal pipes on the windchest have been removed. Only the organ case, the façade pipes and the wood pipes remain. Static wind pressure at blower – 3 ½ in. Minutes of a finance committee for the rebuilding of the Cathedral, dated November 17, 1899, show an smount due for a new organ to be $7,500. These records contain a copy of a letter to John Brown, organ builder from Wilmington Delaware, dated January 17, 1900. Will you please send me specifications for an organ to cost about $7500 giving full details as far as practicable. Also, your judgment as to motor and if you decide on water, what size supply pipe we would use, as we would like to bring in pipe now before work is completed, so that pipe can be concealed. You know my individual preference in all this matter. The new cathedral was dedicated on Sunday morning, October 28, 1900. Church records state that a choir of 60 voices sang under the direction of F.E. Rebarerm and was supported by a 12 piece orchestra and a great organ (presumably the John Brown). In a church publication dated 1902, there is a photo of the Brown organ showing trumpet pipes arranged in Jardine style. In 1912, the John Brown was converted to electric action and continued to be used until 1938, when it was considered unplayable and dismantled. Some of the pipes ended up as demonstrators in a physics class at Savannah High School. Mr. William B. Clarke Jr. saw them there in 1941. The John Brown organ was replaced by a Hammond and followed by a Baldwin in the 1950’s. By 1981, the church was in need of serious structural repair. Receding groundwater had weakened the timber foundation and the decision was made to restore the church to its 1912 condition. At the same time, it was decided to purchase a new pipe organ for the Cathedral. Dr. J Harry Persse, former head of the Music Department at Armstrong State University, assembled a committee to decide on a new organ. Dr. Persse enlisted the aid of William B. Clarke, Jr., who advised the committee to choose a prominent musician in the Catholic Church as the official consultant. The committee selected Richard Proulex in Chicago, who accepted the position. Mr. Clarke sat in on many meetings, assembling a list of suitable organ builders, and assisting in drawing up the final contract. The committee chose the Noack Company of Massachusetts as the builders. The committee members were familiar with the Noack recently installed at Wesley Monumental Church. Mr. Clarke’s involvement with this contract marked the first time in Savannah that a Protestant was allowed to participate in such proceedings. 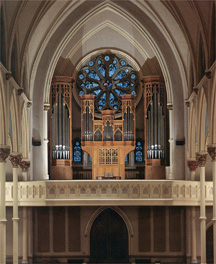 In 1991, after the installation of the new organ, the choir from Mr. Clarke’s church, St. Paul’s Lutheran Church, was the first Protestant choir to present a choir and organ concert at the Cathedral. This concert was directed by Steven Branyon.